Details on how cellulosic surfaces change under changing moisture are incomplete and even existing results are occasionally neglected. Unlike sometimes reported, water adsorption is unsuitable for surface area measurements. However, water can be utilized for assessing surface dynamics. Hygroscopic changes of pulp and bacterial cellulose were studied by dehydrating the samples in a low polarity solvent and then introducing them into a moist atmosphere in a dynamic vapor sorption (DVS) apparatus at 0–93% relative humidity (RH). The DVS treatment caused hygroscopicity loss near applied RH maxima, however, the hygroscopicity increased at RH values > 10–20% units lower. Additionally, the hygroscopic changes were partially reversible near the RH maximum. Therefore the hygroscopicity of cellulose could be controlled by tailoring the exposure history of the sample. Hornification reduced these changes. 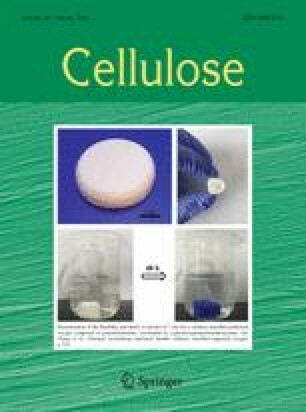 The observations support reported molecular simulations where cellulose was shown to restructure its surface depending on the polarity of its environment. This work was a part of ACel program of the Finnish Bioeconomy Cluster FIBIC. The funding of the Finnish Funding Agency for Technology and Innovation (TEKES) and the Academy of Finland (POROFIBRE Project) is acknowledged. Katarina Dimic-Misic is thanked for providing the BC. Benjamin Wilson is thanked for proofreading. Henna Penttinen is thanked for the initial literature review in her interesting undergraduate thesis on cellulose surfaces in environments with different polarities. This work made use of the Aalto University Nanomicroscopy Center (Aalto-NMC) premises.